Have you ever climbed aboard for THE POLAR EXPRESS™, presented by Countertop Solutions, at Cuyahoga Valley Scenic Railroad? 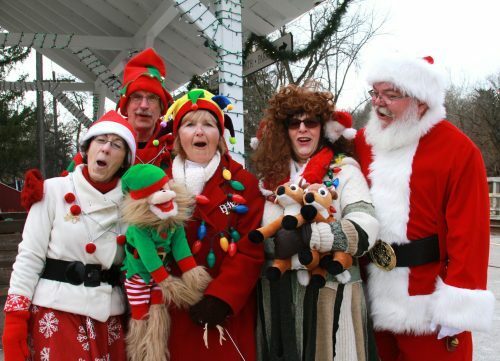 Over the past 24 years the Christmas-themed train ride has become a part of many families holiday traditions, and CVSR is thrilled to be bringing the magic back for its 25th year! THE POLAR EXPRESS™ train ride had its first run in 1994. Based on the 1985 story by Chris Van Allsburg, passengers heard a tape-recorded narration and enjoyed a fun-filled ride the the North Pole. Over the years ridership has grown, and with it the number of volunteers it takes to create a spectacular trip to the North Pole. With over 100 volunteers each night CVSR relies on them to safely board each passenger, lead the program onboard the train, create a fun environment at the North Pole and operate the train. Volunteers are always needed to create a festive atmosphere through personal interaction, song and techniques to engage visitors as we transport more than 40,000 passengers to the enchantment that is the North Pole! Groups and individuals are invited to volunteer onboard the train or at the North Pole! Volunteers that commit at least 4 nights onboard the train OR 6 nights at the North Pole receive EARLY ACCESS to 2019 tickets for THE POLAR EXPRESS™ train ride! See below for details about what each position entails. The North Pole workshop is where all of Santa’s elves patiently wait for the arrival of THE POLAR EXPRESS! As the train pulls up with children’s faces pressed against the glass, you’ll be there in the midst of the fun! Dancing, singing, playing, making toys and just having a blast are the responsibilities of elves at the North Pole. Come dressed in your own elf gear or put on one of our costumes! Sound like something you’d be interested in? Sign up to volunteer today!